NEW DELHI: Among the iconic targets of the 26/11 terrorist attacks in Mumbai — Taj Mahal Hotel, CST and Leopold Cafe — there was one that the local police did not even know existed. When the ministry of external affairs, alerted by Israelis of a terror situation unfolding on November 26, 2008, against Jews residing in Colaba, first reached out to Mumbai Police, the latter’s initial response was that there wasn’t any Jewish centre in the area. Mumbai Police was then grappling with the sheer magnitude of the multi-target attacks, with all its resources on the ground. The call for help by an MEA official, which came amid a sea of rescue calls from affected citizens and VIPs, did not quite set alarm bells ringing. 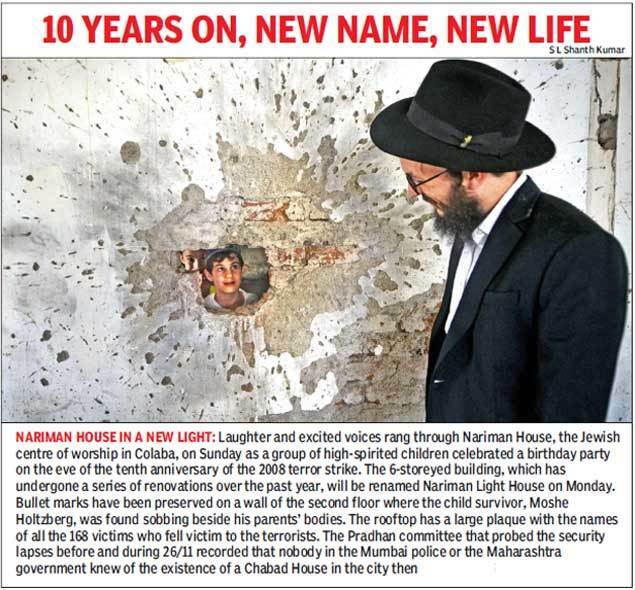 With the local police station and even officials of the special branch’s foreigners division unaware of a Chabad House in Nariman House at Colaba, all the police promised was to check and revert. Meanwhile, an Israeli diplomat had reached Colaba police station to report the attack on Jewish settlement in the area. The control room, which first got the message of firing in Colaba Wadi at 2217 hours, had no idea it was taking place at Nariman House. A senior special branch officer present at Colaba police station decided to head to Taj instead. Central intelligence agencies meanwhile also asked Mumbai police to check on the attack on Jews reported by Israeli embassy through MEA. Finally, it was ACP Issaq Ibrahim Bagwan who decided to move from Leopold Cafe to Colaba Market upon hearing a loud explosion from that side. Even he could not locate the target building since not many in the locality knew the significance of Nariman House. It was only after he reached the spot that he learnt that Jews living there were under fire and in a hostage situation. He called for reinforcements, cordoned off the area and got people vacated from surrounding buildings. The policemen started shooting at terrorists present in Nariman House from nearby buildings. On the morning of November 27, Moshe, the toddler child of the rabbi held hostage there, and his nanny Sandra Samuels came out. The gunfight between Mumbai police and terrorists went on till NSG came in on November 27 afternoon. Rabbi Gavriel Holtzberg and his pregnant wife Rivka were among the five Israeli hostages killed. Interestingly, three intelligence alerts were shared with Mumbai police before 26/11 about possible attacks on Jewish targets. However, Nariman House was not identified as a target. As per Ram Pradhan committee which probed lapses behind 26/11, the threat could have been better handled but “none in Colaba police station or for that matter SB (special branch) knew about the existence of a Jewish settlement in Nariman House”. After the 26/11 attacks, the government got Israeli authorities to share a complete list of Chabad Houses and Jewish centres across India. Requisite security arrangements were put in place.